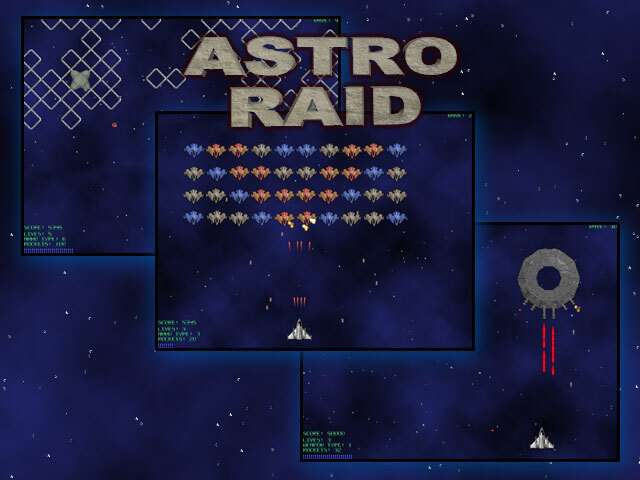 Add one part Space Invaders and one part Galaga, then shake with twist of Asteroids to get AstroRaid, a modern version of an arcade space shooter. The fate of humanity is in your hands! The Earth is in the danger of being destroyed by a fast spreading alien virus that kills anybody it infects. The only hope is a vaccine that was developed on a remote space station by our scientists. You are now on your way back with the precious cargo on board, when you start to understand that the virus was intentionally introduced. How do you know it? Simple - it seems that everything goes wrong on your way back. First, someone tried to kill you while you were inside the space station. Second, unknown forces tried to sabotage your ship launch, but you found the fuel leakage just in time. Finally, you found a bomb on board. And now this - hordes of UFOs and alien ships are getting more and more fierce as you approach the Earth to save its inhabitant`s. Captain, it`s not going to be easy, but with some skills and doggedness you can do it. Just keep your thumb close to the Fire button.